A tribute to the movie projector. The appearance of the cinematic apparatus in its simplest form, using intermitent light and shadows, silence and sound. One 16mm projector. No film, 2 strobe lights, optical sound and light sensors. 30min (time variable). 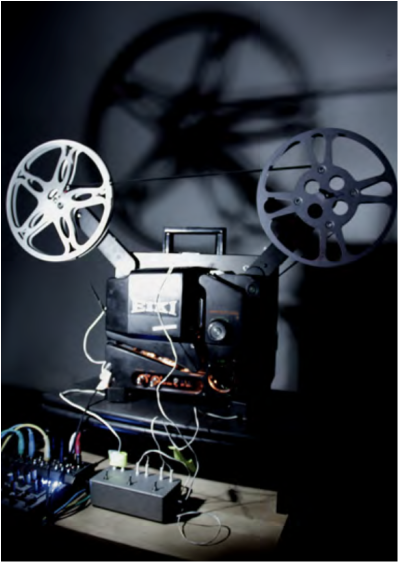 This is a project of Pre- expanded cinema using a 16mm film projector as a research object. The projector becomes the protagonist. and constant repetitive optical sound. Also the vibration of the projector is used trough a sound sensor that is placed in it's interior. These two sources of sound emanating from the projector are fused finally into a sound mixer. reels on the projector. The use of a red and a blue filter on each strobe take the audience to a momentary illusion of perception of the projector shadows in three dimension. Not recommended for people with epilepsy problems. Adriana Vila is a venezuelan filmmaker and visual anthropologist. Focused in the creation of expanded cinema experiences with multiple super8 and 16mm projectors, experimenting with found industrial, domestic-amateur footage, as well as new filmed material, plastic abstract intervention and hand processing. Works on ethnographic auto-critical ideas using concepts of identity, memory, absence and representation. Luis Macías and Adriana Vila’s performances have been screened at Bienal de la imagen en Movimiento (Argentina), Crossroads Film Festival, Artist Television Acces (San Francisco), Millenium Film Center (New York), Echo Park (LA), ITAE and Ocho y Medio (Ecuador), Museum of Modern Art of Bahia (Brazil) Museum of Fine Arts and National Cinematheque (Venezuela), International Video Art Festival of Camaguey (Cuba), S8 Mostra de Cine Periférico (A Coruña), Europes Festival, Mostra Super 8, Loop Festival, Primavera Sound, Centro de Arte La Virreina, The Prop festival and Sonar Festival (Barcelona).